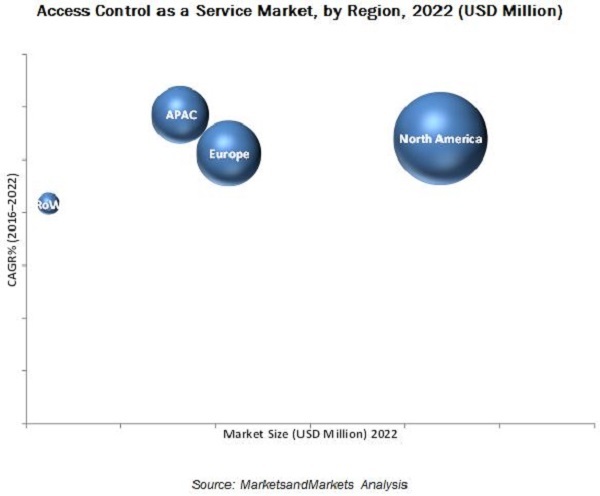 The Access Control as a Service Market (ACaaS) is expected to reach USD 1,678.3 Million by 2022, at a CAGR of 26.82% during the forecast period. The objectives of the report includes forecast of the ACaaS market by service, deployment, end-use application, and geography. Further, it includes the detailed information regarding the drivers of the market such as the increased demand for ACaaS from businesses with multiple locations to centralize their operations and security risks raised in the IT industry by bring your device policy. It also includes detailed information about the restraints, opportunities, and challenges in the ACaaS market. The study of the value chain and analysis of the impact of Porter’s five forces on the market is also one of the objectives of the report which includes the study of the impact of the Porter’s five forces, namely, threat of substitutes, intensity of competitive rivalry, threat of new entrants, bargaining power of buyers, and bargaining power of suppliers on the access control as a service market. The major players of the ACaaS ecosystem were identified across regions, and their offerings, distribution channels, and regional presence is understood through in-depth discussions. Also, average revenue generated by these companies, segmented on the basis of region, is used to arrive at the overall access control as a service market size. This overall market size is used in the top-down procedure to estimate the sizes of other individual markets through percentage splits from secondary sources directories, databases such as Hoovers, Bloomberg Businessweek, Factiva, OneSource, and primary research. The entire procedure includes the study of the annual and financial reports of the top market players and extensive interview with industry experts such as CEOs, VPs, directors, and marketing executives for key insights. 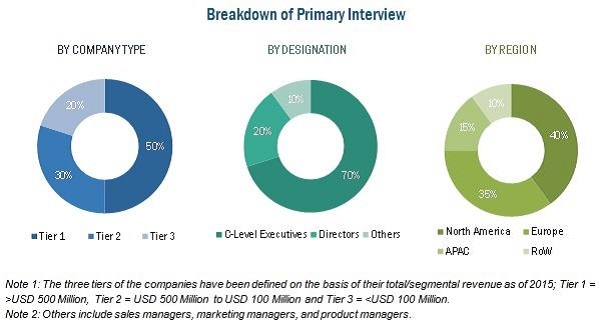 The ACaaS market ecosystem includes ACaaS providers such as Brivo Inc. (U.S.), Cloudastructure Inc. (U.S.), Tyco Security Products (Ireland), Assa Abloy AB (Sweden), and Dorma + Kaba Holding AG (Switzerland), Honeywell Security (U.S.), Microsoft Corporation (U.S.), Cisco Systems Inc. (U.S.), Datawatch Systems Inc. (U.S.), Centrify Corporation (U.S.), AIT Ltd. (U.K.), Gemalto N.V. (Netherlands), Vanderbilt Industries (U.S.), M3T Corporation (U.S.), ADS Security (U.S.), KISI Inc. (U.S.), and Feenics (Canada) among others, who offer access control as a service market to end-user industries. Study answers several questions for the stakeholders, primarily which market segments to focus in the next two to five years (depends on the range of forecast period) for prioritizing the efforts and investments. Company Profiles: Detailed analysis of the major companies present in the ACaaS market. The access control as a service market is expected to reach USD 1,678.3 Million by 2022, growing at a CAGR of 26.82% between 2016 and 2022. The key factor driving this market has been the increased demand for ACaaS from businesses with multiple locations to centralize their operations. Furthermore, the large-scale adoption of Internet of Things (IoT) and increased usage of advance virtualization and cloud computing platforms is expected to propel the growth of the ACaaS market. Among all the major end-use applications of ACaaS market, the commercial application has been driving the market. The increasing demand of access control systems for assuring security and reducing human efforts for the same at the commercial and corporate infrastructure has been the key driving factor for the market for commercial application. However, the market for the manufacturing and industrial application is expected to grow at the highest rate during the forecast period. As of 2015, the hosted services held a major share of the access control as a service market. As the hosted service is web based, the clients need not to look after the maintenance of the server. This has been the key driving factor for the hosted service market. However, the market for managed services is expected to grow at the highest rate between 2016 and 2022. This growth is attributed to the ability of the managed services to reduce the burden of adding and deleting access rights on the user as these services are managed by a third party for the user. The public cloud deployed ACaaS is expected to hold a major share of the ACaaS market. The ability of the public clouds to store the data and make it available for the users at any location has been the key driving factor for the public cloud deployed market. Even the rapidly increasing need of reliable ACaaS for transportation industry across the globe has been fueling the public cloud deployed access control as a service market. However, the market for private deployed ACaaS is expected to grow at the highest rate during the forecast period. In terms of different geographic regions, the market in the North America region is expected to hold the largest market share between 2016 and 2022. The stabilized constructions in North America and convergence of mechanical and electronic security products for the same has been the key driving factor for the North American market. The European market is expected to capture the second-largest share during the forecast period. The commercial, government bodies, and manufacturing and industrial applications are expected to be the leading segments of the European ACaaS market. The adoption of Access Control as a Service Market have been on the rise and set to be one of the fastest growing areas of physical security. ACaaS replaces up-front capital expenditures with unvarying subscription-based operational expenses, which, in turn, causes reduction in the total cost of ownership. This makes physical security industry shift from capital expenditure to operational expenditure model. However, traditional access control systems integrators and installers are slow in adapting to the latest technologies such as cloud computing and Access Control as a Service with the fear of handling operational functions to third-party people. Hence, limited end-user awareness and slow adoption to latest technologies by traditional access control systems integrators and installers form a key factor that hinders the growth of the ACaaS market. Brivo Inc. (U.S.) is one of the global leading players in cloud-based physical access control and video security systems and provides centralized security management for global enterprises. The company has been focusing on expanding its customer base by offering better and safety solutions. In March 2016, the company registered its Brivo OnAir for Government on the GSA Approved Product List (APL #10073) under the PACS Infrastructure category. The company has been focusing providing its cloud-based access control services to several applications, such as loT, mobile technology, data, social media, and cloud computing. Figure 45 SWOT Analysis: Brivo Inc. Figure 46 SWOT Analysis: Cloudastructure Inc.